Andre Bell says working with kids is a little like the poetry he writes. It’s all about understanding his audience. “You have to have patience with them and develop a friendship,” Bell says of his work at the Jerry Colangelo Branch of the Boys & Girls Club of Metropolitan Phoenix, a huge facility that opened in the spring of 2009 near 35th Avenue and McDowell Road, not far from the GCU campus. Bell and two other GCU students, Daniel Garay and Victor Terrell-Carazo, have been in the relationship-formation business this summer at the Colangelo Branch as part of the University’s work-study program. They’re paid by GCU but considered volunteers by the club, which helps the club’s budget. 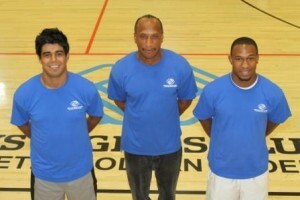 Pictured left to right: Daniel Garay, Andre Bell and Victor Terrel-Carazo. In all, 10 students are working at Boys & Girls Clubs throughout the Valley this summer. The other seven are: Katie Bremerthon, Aldo Munoz Gonzalez, William McClarty, Ann Olvera, Yousef Ramadan, Evelia Stacey and Nick Sykes. The value of having college students as role models shouldn’t be underestimated, according to Bridget McDonald, vice president of club operations for the Boys & Girls Club. As many as 850 youths from age 5 through 18 cycle through the Colangelo Branch during the summer, says branch manager Lemuel Carter, who raves about the one-on-one connections Bell, Garay and Terrell-Carazo have made. “There’s nothing like having them look the part of college students and speak about why college is important after high school,” Carter says. The Colangelo Branch is equipped with game rooms, two gyms, a computer lab, a resource center and a lunch room. It operates in partnership with the Isaac School District. Bell, a Christian studies major at GCU, says it’s challenging but not impossible to be a friend and an authority figure at the same time. Eleven-year-old Zaiveon Greer seems to have blossomed with attention from Bell. “He’s nice, and he’s taught me to respect other people,” the boy says of their relationship. Garay, who is studying business administration at GCU, says it’s important to “be firm before being fun” but admits he’s learning as much from the younger ones as they are from him. “They ask the same kinds of questions I did when I was a 12-year-old,” he says. Terrell-Carazo, a secondary-education major, says there’s nothing like knowing he is making a difference. “The bond you form with them is really rewarding,” he says. GCU will host the statewide Keystone Convention of the Boys & Girls Club on campus Sept. 10-12. Reach Doug Carroll at 602.639.8011 or at doug.carroll@gcu.edu. God bless you, Andre, and friends! Keep on giving doing what you are doing and making a difference. I was very impressed to see that you also work at the boys and girls club. I work at the Boys and Girls Club of Nash and Edgecombe Counties. I have beeen employed with them for 5 years and love the kids and what I do! It makes me feel good to know that you take the time out to contribute your time to those kids!! May God continue to bless your efforts and heart for helping with His most valuable children”suffer little children, come unto me, and forbid them not” I am looking for a Boys and Girl club for my 10yr granddaughter that is in my care my zipcode is 85301, if any one know of one near us please e-mail me the info, thanks, Blessings!